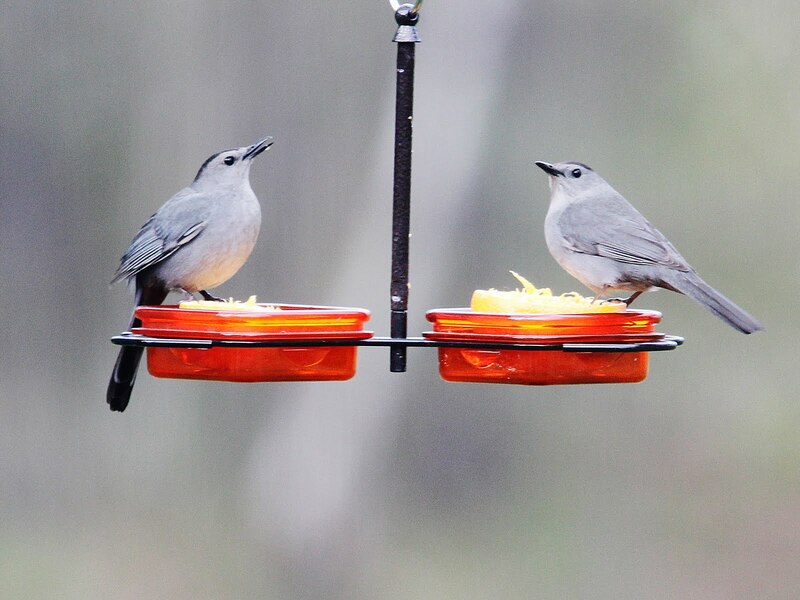 Cosy pair of Gray Catbirds, who love the oranges! We have 2 pairs of nesting Catbirds. View of part of the hayfield. We have Bobolinks nesting in our fields and make sure our farmer does not hay the field until late August, after all the Bobolinks have fledged. 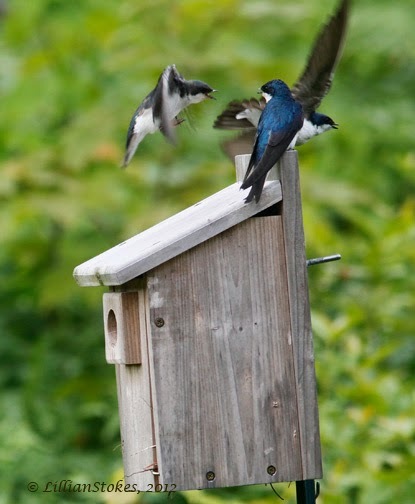 We have 15 nesting pairs of Tree Swallows in the bird houses we provide. 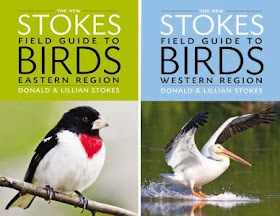 That's great, as this is a declining species near us. 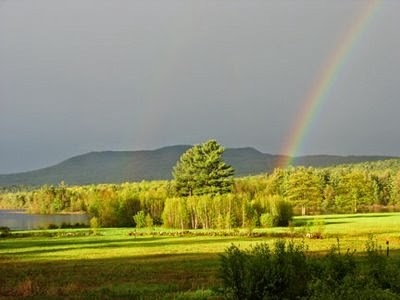 Lots going on here at Bobolink Farm, our NH home. We feel like bird farmers. 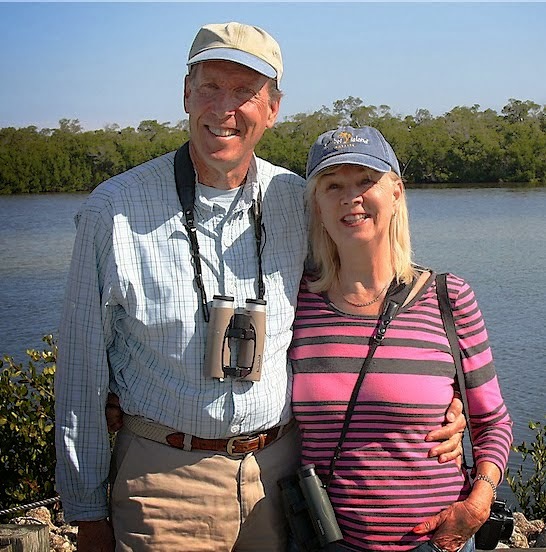 Breeding birds are everywhere, with many taking advantage of the habitat we have created, our bird feeders and bird houses. It's a great time of year to sit on our deck and watch the show around us. So many baby birds in the works. 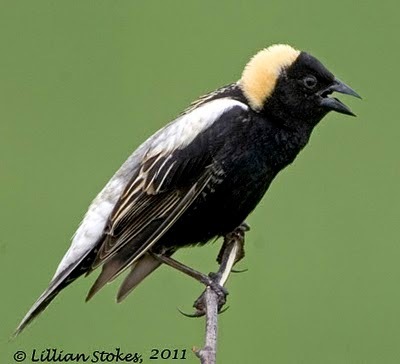 It gives us great pleasure to know we are helping so many birds, especially since many of these birds, such as Bobolinks, continue to have population declines due to lack of suitable habitat. 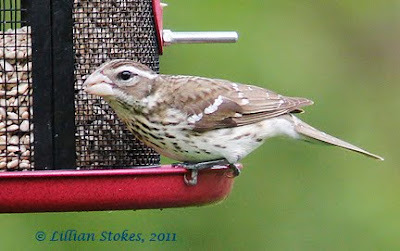 Rose-breasted Grosbeaks, Can't Get Enough of Them! making it possible to individually identify them. 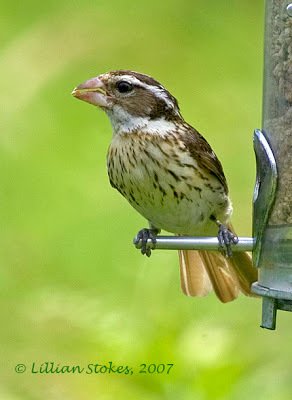 Female Rose-breasted Grosbeaks are more subtly colored. 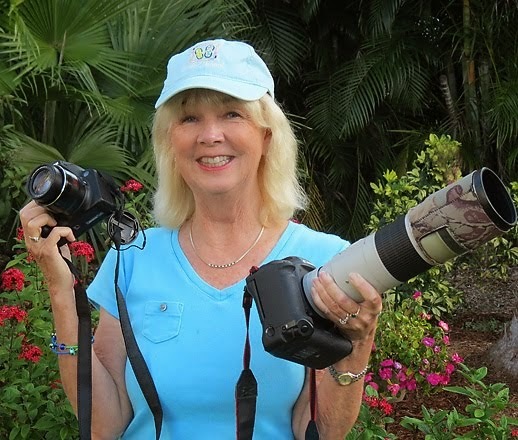 Here's another example of a female. Here's a 1st-winter male Rose-breasted Grosbeak. He looks much like the female but with a variable rosy wash on the breast. The 1st-winter female looks much like the adult female. 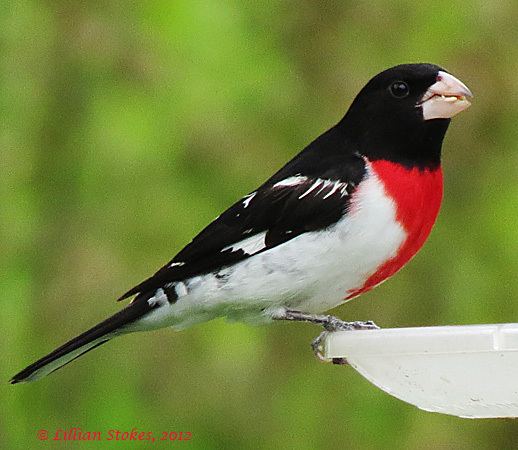 Can one get enough of Rose-breasted Grosbeaks? I think not. We celebrate their arrival each spring. They're strikingly gorgeous. We're lucky because we have them visiting our feeders regularly. 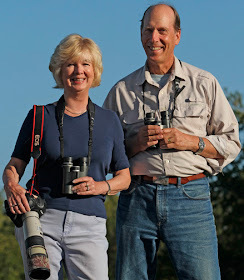 They must be nesting nearby, although we do not know exactly where. 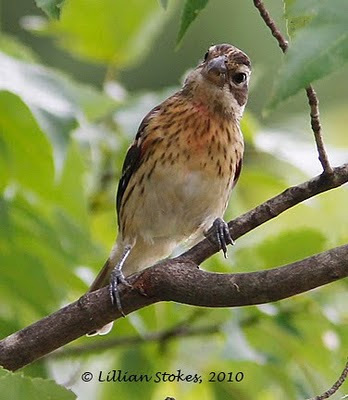 Maybe they will bring the fledglings to the feeder as they have done in the past. 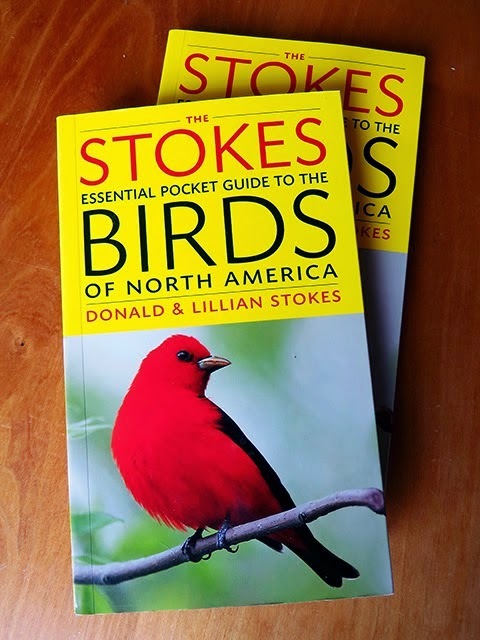 The male's plumage is so striking with the dramatic red on the white breast. 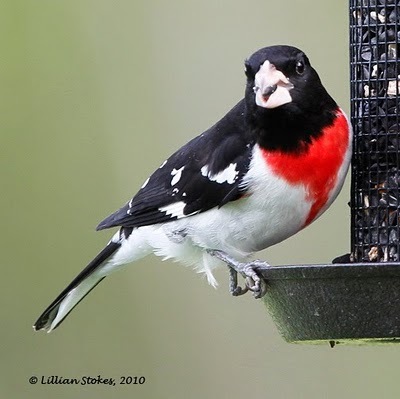 One of the things we look at is the red bib of red on the male. 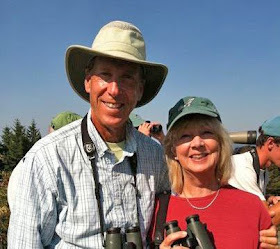 It is a slightly different shape for each bird, making it possible to often recognize individuals. The female is not as knock-your-socks-off brilliantly colored as the male. 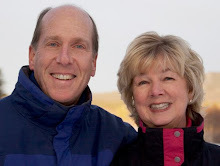 Then again, he does not have to sit on the nest, as she does, a sitting duck for any predator. So, for her, it's much better to have subtle, more camouflaged colors. 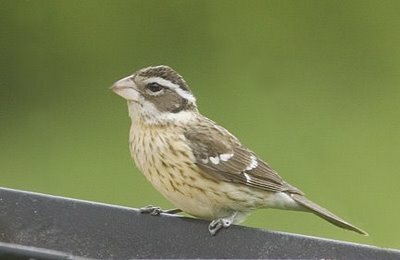 The young male Rose-breasted Grosbeak at first looks like the adult female but with a rosy wash on his breast. Eventually he will acquire the plumage of the adult male. 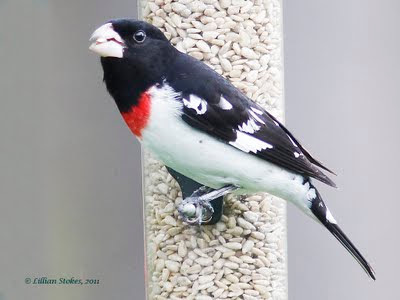 Rose-breasted Grosbeaks breed in the upper quadrant of the eastern half of the U.S. and much of Canada and winter south of the U.S., so many people may see them during migration in many parts of the country. Attract them to your feeders with black oil sunflower seed, in the shell or shell less, their favorite. 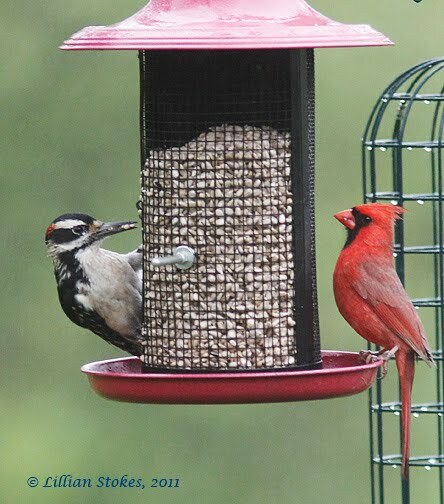 Make sure that feeders have a ledge or wide enough perching area for them to land. 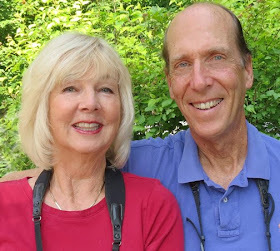 Enjoy your weekend, hope you see some Rose-breasted Grosbeaks!